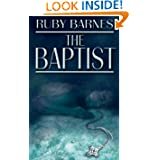 I was first introduced to Ruby Barnes and The Baptist when I received the first three chapters as an assignment on a peer writer critique site. I believe my first reaction fell somewhere into the—You have got to freaking be kidding me!—category. Shocking comes to mind when I think about this story. I read a lot of beginnings to novels, but rarely do I have one stick with me like The Baptist did. I couldn’t get the story off my mind and found myself watching for its release date. You have got to admire an author who can make a connection like this with their writing. My only regret is for taking so long to write up my review. Having read the thriller “Peril” last year and thoroughly enjoying the story, I already knew Ruby Barnes could write. John, the main character in The Baptist, earns his title when he freaks out one day and decides his brother is evil and a danger to all those around him—mainly John and his parents—and so he chooses to drown his brother in the bathtub. Any normal parents would understandably be shocked by this turn of events. Not only did they lose the son John killed, they also lose John. He is committed to a mental institution and spends the rest of his childhood growing up with an assortment of amusing characters who are just as messed up as he is. You’ll have to read the novel for yourself if you want to know what goes on behind closed mental ward walls, but I will say this, “One Flew Over the Cuckoo’s Nest” by Ken Kesey comes in a definite second to some of the antics John and his new psychopathic friends dream up. Ruby Barnes pushes barriers many might wish he’d well left alone. But the mental institution is only the beginning of the rollercoaster ride we take with John. Once the doctors state he is well enough, John is released to a clueless society. We are left somewhat surprised when he manages to actually blend in; he finds a job, gets married and has a couple of kids. By all outward appearance, John becomes a solid member of society—until he stops taking his medication and ends up baptizing another evil man—an unlucky stranger out hitchhiking in the wrong place at the wrong time. And though John is definitely a dangerous person to be around, and not one to ever be fully trusted, we begin to understand and identify with the drive behind a mind that is never quite sane. My feelings alternated between fear for John’s young family, and hope, that he’d find a way to overcome the lifelong demons who rode his shoulders. Bottom line—John’s actions are despicable, horrifying, and guaranteed to make you cringe in more than a few places, but at the same time we find he is not a totally unlikable character. He is a messed up young man trying to fight for his life and sanity in an often insane world. Who among us can’t identify with that during the difficult times of our lives? Definitely a novel I’d recommend to all you thrill seekers and adrenalin junkies out there searching for your next fright. Posted by Denna Holm on June 2, 2012 in Archives and tagged chilling, five stars, Horror, murder, psychopath, religion, snapped, tension level, thriller.